Strata Keynote: Is Privacy Becoming a Luxury Good? 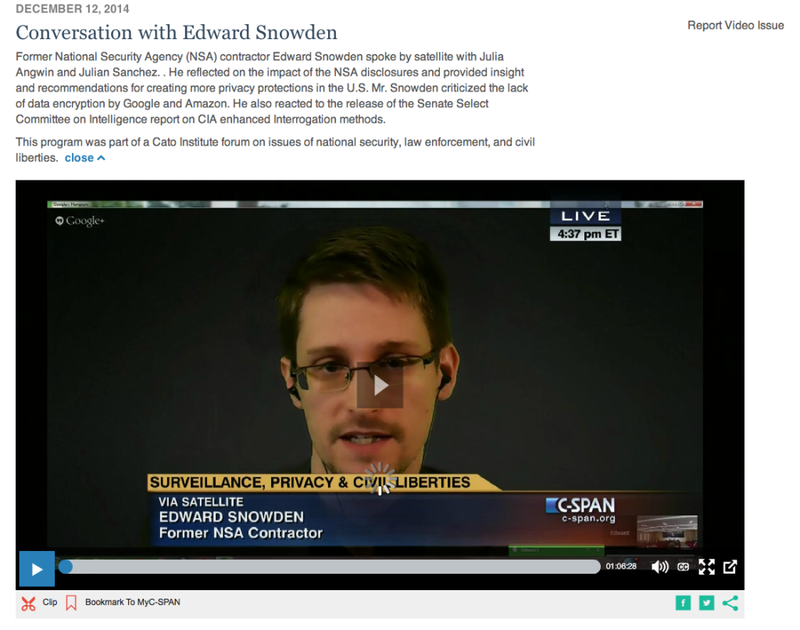 I appeared on PBS Frontline’s two-part series on privacy and mass surveillance in the U.S. You can watch me on part two of the program, which aired on May 20, 2014. (Part one aired May 13.) Or, read transcripts from both segments. I appeared on ABC’s “This Week” with privacy researcher Ashkan Soltani to discuss how indiscriminate surveillance both on- and offline is creating a world where it will be impossible not to be found. Catch me on Moyers & Company, where I sat down with Bill Moyers for a discussion about why mass data collection has not made us safer, how journalists are the “canaries in the coal mine” in our era of surveillance, and more. Read a transcript here, or watch the full interview below. I appeared on a segment of “60 Minutes Overtime,” where I shared some of my experiences trying to evade data brokers while researching Dragnet Nation. Read a summary, or watch the full segment below. I’ve been on this beat for four years. I wrote the book because I felt that all my stories were really scary — they are tracking you here, they are tracking you there — but they weren’t actionable; in other words, people couldn’t figure out what to do about it. I was hopeful a book could provide some advice. What was it like to be working on the book when the Snowden bombshells started to fall? I still remember where was I standing when the first Snowden revelation about the Verizon secret order for the phone dragnet came out. My whole world was just turned upside down. I had been chasing that story because I had heard that that it was true. A lot of people that followed this issue had suspected it was going on, but no one had ever seen the proof. It was just mindboggling to see how vast it was. And then what happened after that, the continual flow, I mean even to this day, every week, there has been a new revelation. Read the full interview, along with a review of Dragnet Nation, on Salon.com. On February 26th, I spoke about Dragnet Nation at the Brennan Center for Justice in New York. Hear me on the Leonard Lopate Show on WNYC in New York, or read a summary here. I sat down with the hosts of CBS This Morning to discuss data brokers, deleting Facebook friends, and other attempts to erase my digital footprint. I spoke with NPR’s Dave Davies on February 24, sharing an excerpt from Dragnet Nation and explaining why in the current climate of indiscriminate tracking, privacy is becoming a luxury good. On February 21, I spoke with The Wall Street Journal‘s Simon Constable about protecting kids’ privacy online. Click here for more recent talks and appearances.